We all get stuck in a wine rut now and then, drinking the same old favourites. But one of the best things ever is stumbling across a wine you’ve never tried before, and going, ‘ooh, hello!’. One of the nicest parts of our job is finding those wines for you. We're always asking winemakers, what’s the next big thing? What grapes are trending? What new styles would make Angels go, ‘ooh, hello!’? To give you the best of both worlds, we’ve popped all the new wines in a case with a bunch of comforting Angel favourites. That means you can sample the newbies without taking a complete punt. And maybe have a cheeky taste-off between the old and the new. Includes a superb gold-medal winning Cotes du Rhone, Ben's 94%-rated Minervois and Bill & Claudia's brand-new Gewurtz! Bruwer has won every award under the sun - and rather than letting success go to his head, he always keeps some in reserve for his favourite Angels. After making his super duper premium flagship wine, he had a few grapes left over and he's sharing them with YOU. Wines by such an iconic winemaker shouldn't come this cheap. Fresh as a daisy, drinks best whilst young, which is great because you won't be able to stop yourself from drinking it up right away. Denis carefully selected the grapes that went into this delightfully gluggable wine as only the best were fit for the job. Two words that spring to mind with this one? Juicy and fresh. There’s an abundance of red fruit aromas to ignite the senses. We're talking strawberries, raspberries and redcurrants with a little twist of black cherries just for good measure. It’s dangerously moreish stuff. 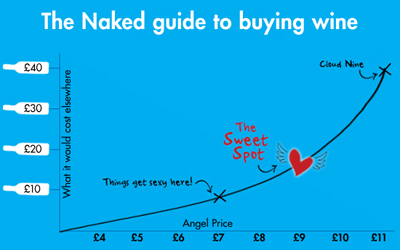 As an Angel, you get it it at a jaw-dropping price. So if it’s value for money you’re after then look no further; Denis has the answer! Originally trained in Bordeaux, Jean-Pascal is now an icon in Chile - where every delicious wine he touches ends up dripping in medals and critical acclaim. He's worked his magic on two of Chile's most popular grape varieties to create this show-stopper of a wine - especially for YOU. The magical mix of Angel funding, supreme winemaking and ultra-premium grapes make every last drop of his Cabernet Carmenere over-deliver. David knows just where to find the richest and juiciest parcels in Spain and he has uncovered this hidden beauty deep in the heart of Cariñena. Jam packed with delicious ripe cranberries, red cherries and raspberries, this is one of David’s favourite varieties. It’s bursting with fun and fresh fruit flavours. This juicy wine pairs perfectly with a succulent leg of roast lamb, or if you want to want to go off piste then a nicely spicy chicken tandoori will make this wine sing. Thanks to Angel funding, Bill and Claudia were able to make their first ever Gewurztraminer. It’s their first new variety for a couple of years and there’s only a limited number of them so make sure you snap it up quickly. They have worked their magic once again, with this wine oozing classic Gewurz flavours and aromas. We’re talking rose petal, spices and a plethora of exotic deliciousness. It’s full-flavoured, beautifully balanced with a slightly off-dry finish and they hope you love drinking it as much as they loved making it!